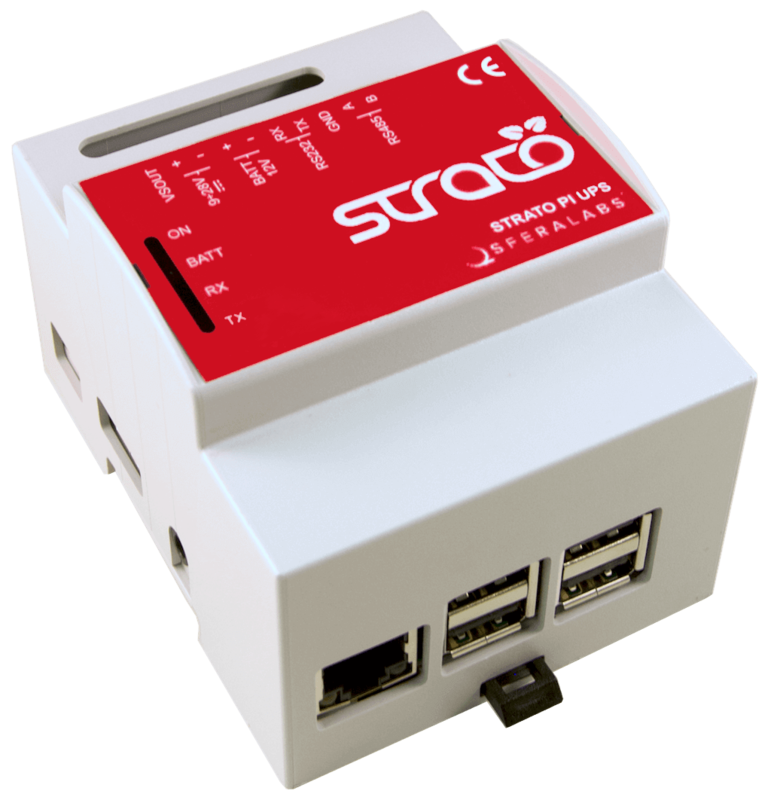 Strato Pi enhances the Raspberry Pi computer with several hardware features to make it suitable for use in professional and industrial applications where reliability and service continuity are key requirements. 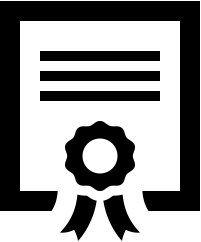 Strato Pi can be employed for professional applications where extreme reliability, ruggedness and compliance with technical and safety directives are required. It is compliant with the 2014/35/UE (Low Voltage) and 2014/30/UE (EMC) CE directives, and the harmonised standards for electromagnetic compatibility (EN61000-6-2:2005), electrical safety (EN60664-1:2007), emission (EN61000-6-4:2007) as well as the RoHS directive for hazardous substances (2011/65/UE). It is also compliant with part 15 of the FCC rules (Class A), ICES-003 (A) and CISPR 32:2015 (Class A) standards. A high quality and stable power supply is extremely important to ensure reliable operation of your Raspberry Pi. Most USB power supplies are designed to recharge mobile devices, and not for continuous 24/7 loads in harsh industrial environments. Strato Pi accepts a wide power supply range and is able to effectively handle substantial amounts of ripple, noise and supply voltage fluctuations. The power supply stage is a heavily protected and filtered circuit, using oversized electrolytic capacitors, diodes and inductors, and a high efficiency voltage regulator. The step-down converter is based on advanced, high-output-current PWM converter integrated circuits with low resistance MOSFET, with approximately 95% efficiency and up to 3A continuous output current. It includes over current limiting, over voltage protection and thermal shutdown. The power supply stage is also protected from reverse polarity with resettable fuses. Surge protection up to ±500V/2ohms 1.2/50μs ensures reliability in harsh environments. In many cases, and specifically with database and data collection applications, losing data because of a sudden power interruption is simply not an option. Strato Pi has an integrated uninterruptible power supply that guarantees ample time to save your data and perform a clean shutdown in case of a power failure. The battery power supply stage is a heavily protected and filtered circuit, performing the supplying of Strato Pi circuits without any interruption of its operations when the main power supply fails. This stage also performs the charging of the battery through a high efficiency step-up converter, thus generating the optimal charging voltage independently from the main supply value. Dedicated GPIO pins are used to monitor the power status and control the shutdown cycle. 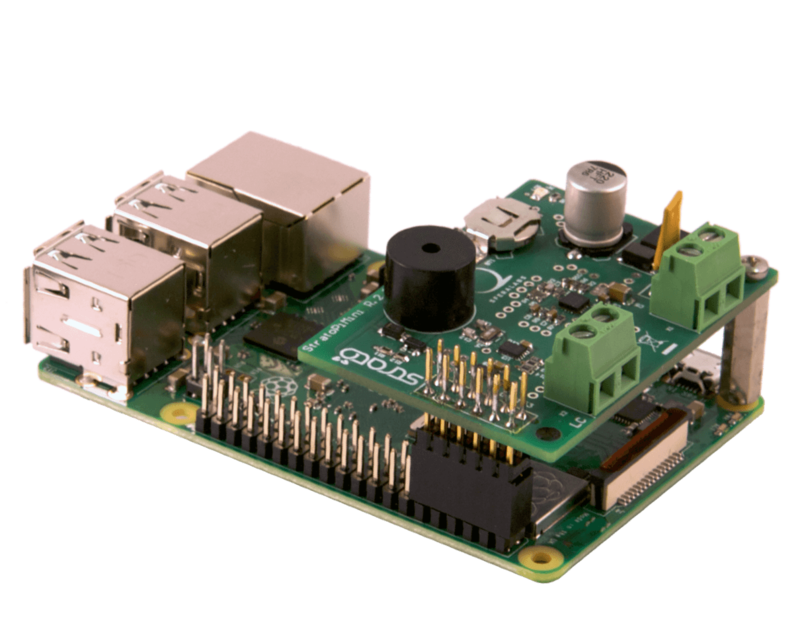 Having full control of the power-down process from any software on the Raspberry Pi is a great feature that should allow you to implement a clean and safe operating system shutdown when power is lost. The Raspberry Pi relies on Internet time servers to set its internal clock to the current date and time on start-up. If your applications always requires the correct time, even when not connected to the Internet, then you need to have a local real time clock/calendar to permanently keep track of time, even when the Raspberry Pi is off. Strato Pi features a battery-backed real time clock/calendar, directly connected to the Raspberry board through the I2C bus interface. The automatic switch-over to a lithium battery guarantees the functionality of the RTC when its main power supply fails. The real time clock is based on the MCP79410 general purpose RTCC chip from Microchip. 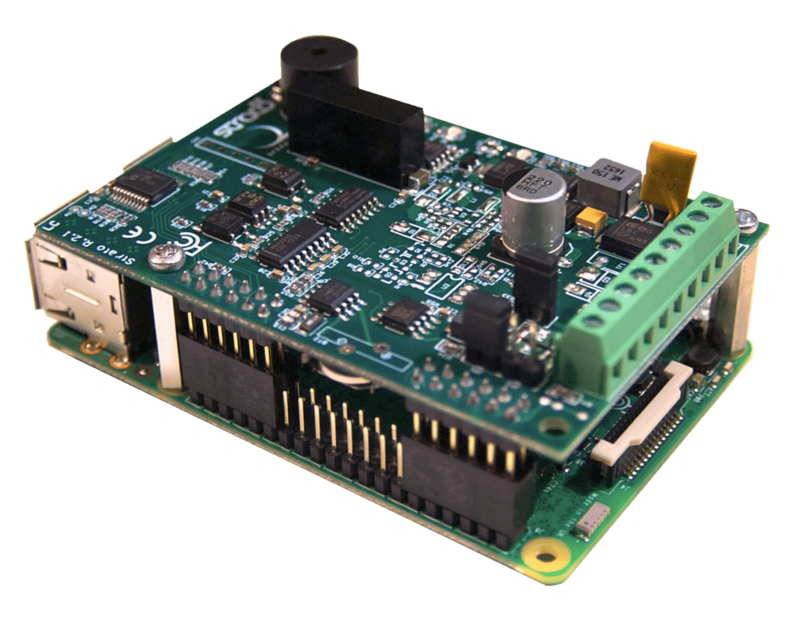 It is connected to the Raspberry Pi’s I2C bus and, besides the standard clock function, it has several other advanced features. A replaceable CR1025 battery is used as a backup power source when the main power is not available. If Strato Pi is always powered, the battery should last well over 10 years. RS-232 and RS-485 serial ports are still widely used to connect devices in industrial automation and other applications. The Raspberry Pi lacks the circuitry to implement these protocols. While many USB adapters are available at reasonable price, they are usually not heavily protected and isolated. 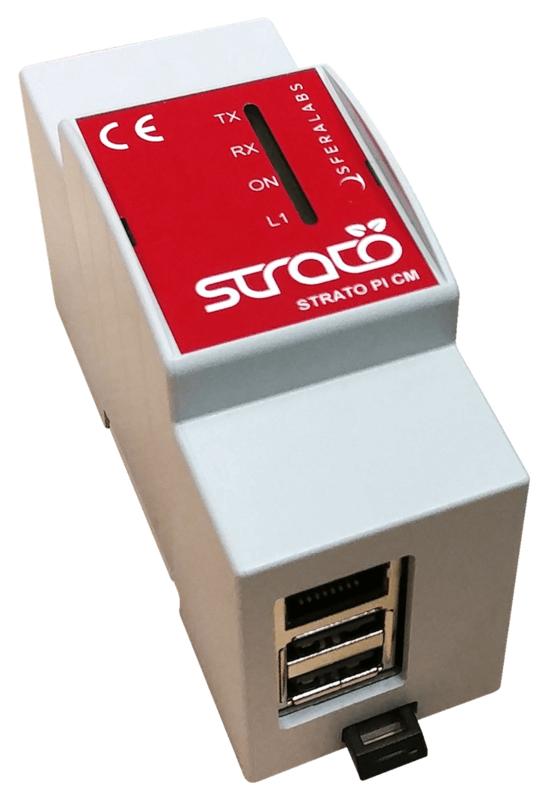 The interface circuits of the RS-232 and RS-485 serial ports on Strato Pi are insulated from the main and battery power supply voltages, thus avoiding possible failures due to ground loops. The insulation is obtained by means of a high efficiency isolated DC-DC converter and three hi-speed opto-couplers. A micro-controller, using a proprietary algorithm, automatically manages the data direction of RS-485, taking into account the baud rate and the number of bits, without any special configuration. 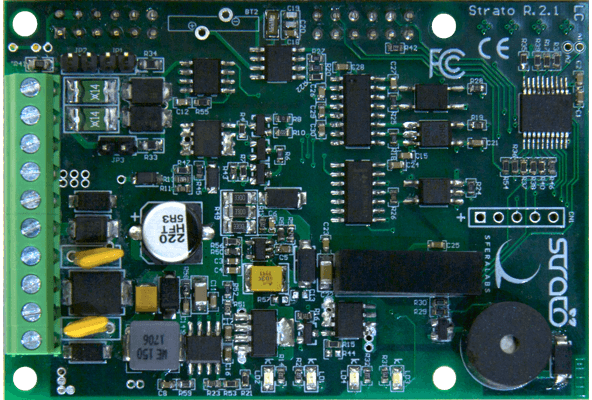 The Raspberry board can therefore communicate through its TX/RX lines without any other additional signal. The Controller Area Network (CAN) bus is a widely used communication standard in the automotive industry as well as many other products that require a robust communication protocol based on a multi-master architecture. 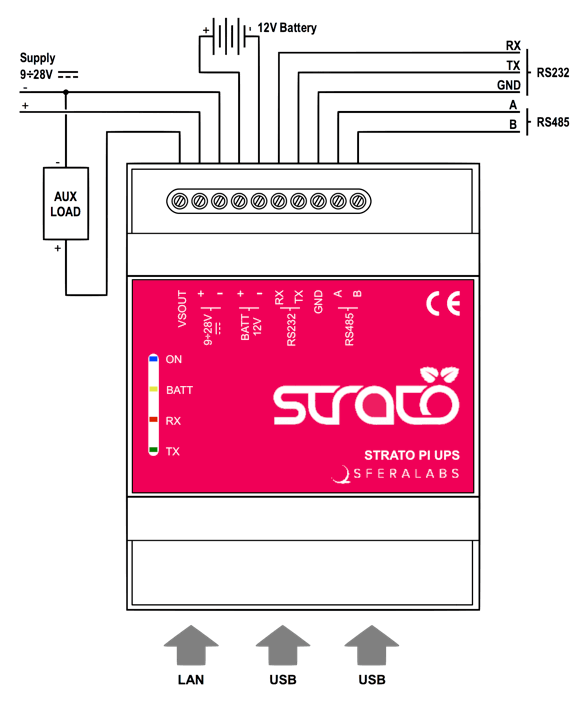 Strato Pi CAN implements an easy to use CAN bus controller with an opto-isolated physical interface. 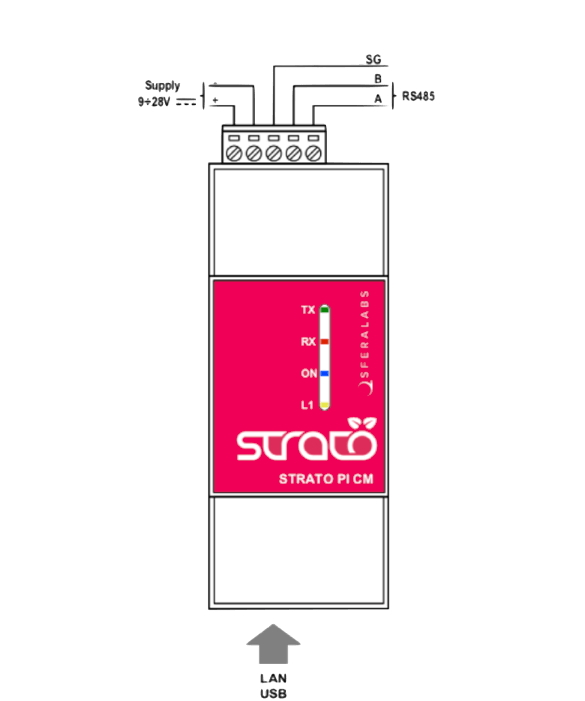 Strato Pi CAN features both RS-485 and CAN bus ports. Both ports can be used at the same time. 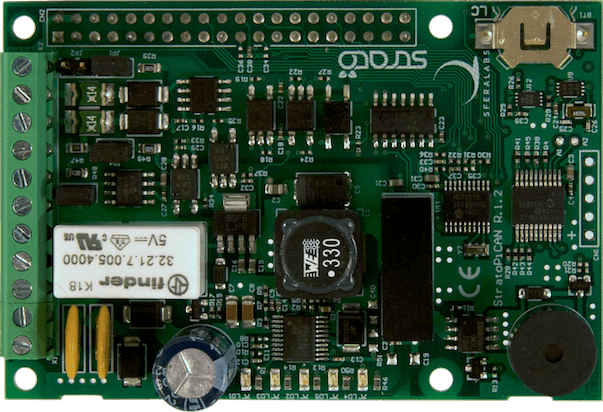 The CAN bus interface is based on the Microchip MCP2515 stand-alone controller and the Microchip MCP2561 high-speed transceiver. 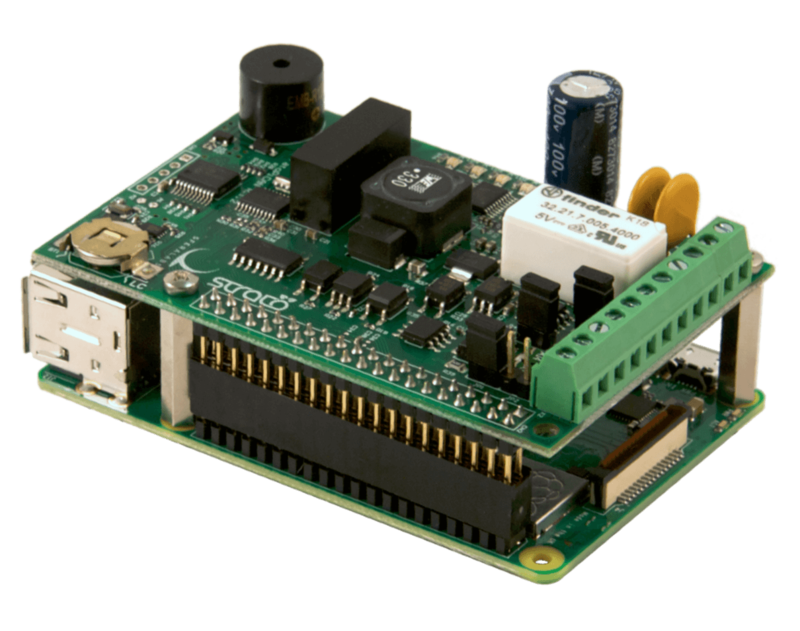 The MCP2515 connects to the Raspberry Pi via the SPI port and is well supported by the SocketCAN driver. 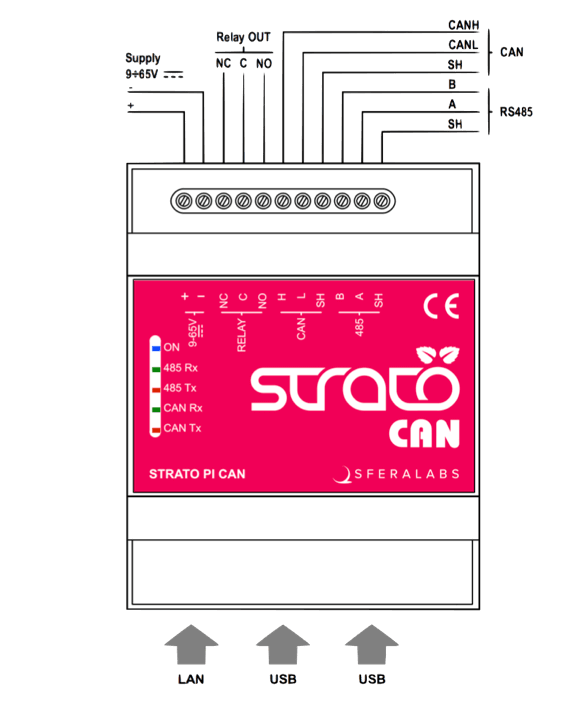 Strato Pi CAN implement the CAN specification version 2.0B, and support up to 1 Mbps speed. The CAN transceiver’s TX and RX lines are isolated from the CAN controller with dedicated opto-couplers. 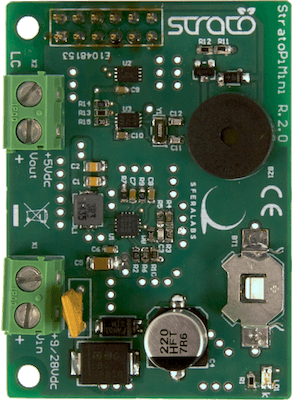 The CAN transceiver is also galvanically isolated from the CAN controller and the Raspberry Pi by the same high-efficiency DC-DC converter used to power the RS-485 line drivers. A hardware watchdog is an electronic circuit that can reset the processor if, for any reason, the software application appears to be stuck. An automatic hardware restart after a software hang can save your day, particularly on unattended applications that need to work continuously. 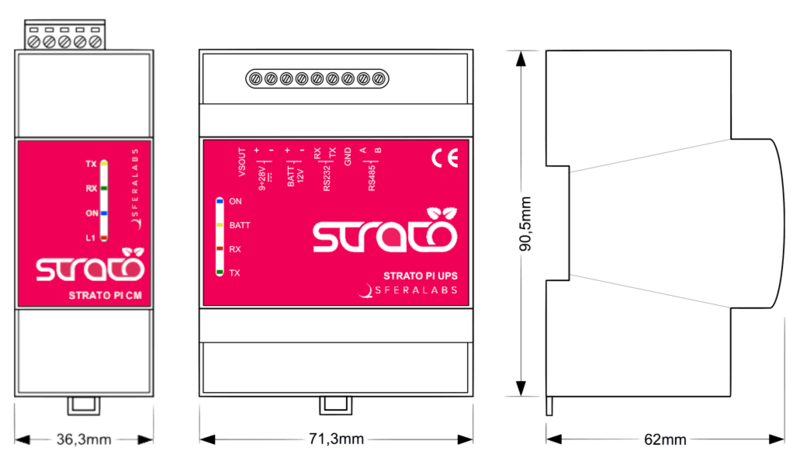 Taking advantage of the Strato Pi on-board microcontroller, we have implemented an hardware watchdog circuit that can be used, upon a software hang, to reset the Raspberry Pi, as well as the auxiliary power supply output on Strato Pi UPS. 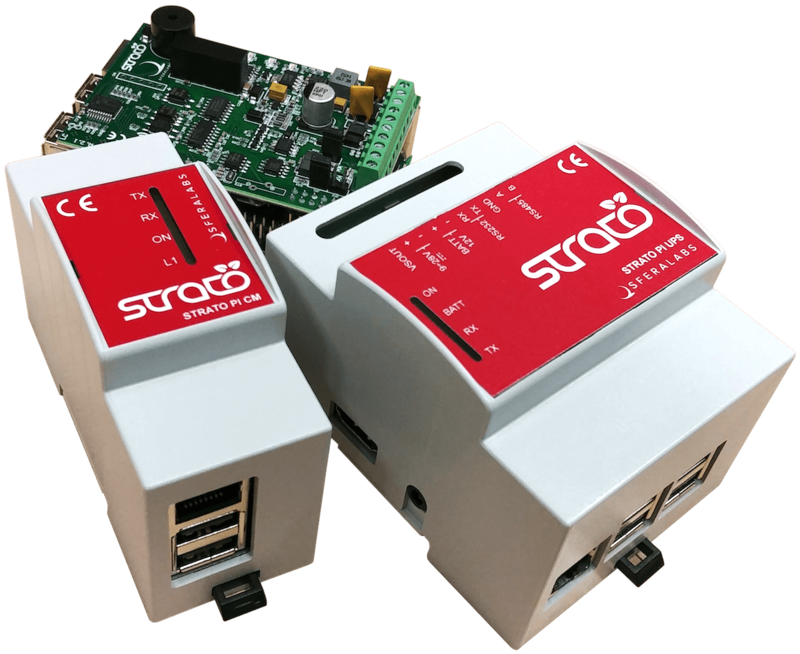 The Strato Pi watchdog is completely independent from the Raspberry Pi’s internal CPU watchdog circuit and, being controlled by Raspberry Pi’s GPIO pins, it is extremely easy to control from your application and very effective in recovering from unexpected malfunction. A standard, modular enclosure is usually a strong requirement in most industrial and professional installations. A bare Raspberry Pi can’t be used as-is in these cases. Strato Pi server is housed in a standard industrial 4-modules wide DIN case with omega-rail mounts, while Strato Pi CM in a more compact 2-modules wide DIN case. 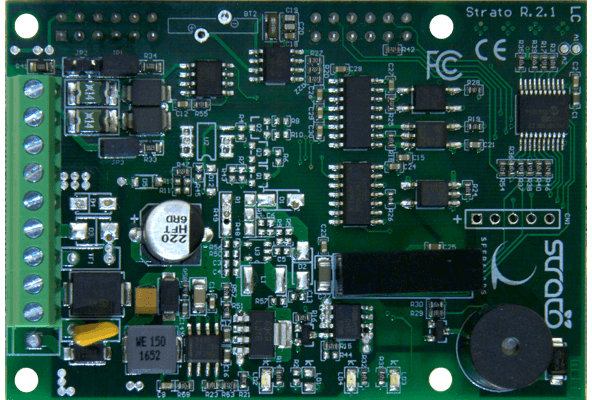 The Strato Pi boards pack all their components in a relatively small, high quality 4-layer PCB. They are mounted on top of the Raspberry Pi and have a footprint that does not exceed the Raspberry Pi’s own size, making it compatible with several third-party enclosures.